Curry Leaves are the most untouchables in our food. I thought why not subsitute coriander Leaves with Curry Leaves in Potatoes. Fortunately I had them today. I made and it turned out really good tasting slightly different. Chop Ginger, Garlic, Curry Leaves and Chillies. Grind to a coarse paste. Cook Potatoes. Peel the skin and dice into small cubes. Heat Oil in a Pan. Add Cumin. Allow it to crackle. Now add Potatoes, Sambar Powder, Salt and the ground paste. Stir well. Cook till Potatoes get a roasted coating of Sambar Powder. Serve with steamed Rice and Sambar or any Kuzhambu OR Lemon Rice. 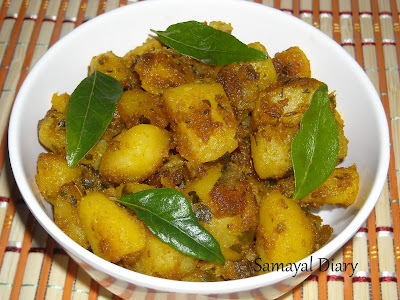 i love potato poriyal with sambar or thayir sadam...u looks very delicious..
looks delicious..great idea of using curry leaves..its untouched, but has so many health benefits rt..
Yum, I can almost taste the flavor. Very new, never added curry leaves. That's an unique recipe! Delicious!